Fam.. I decided against having Redd do the funeralization for my beloved potholder..but many of you wanted to know what happened..so teary eyed and all..here goes. It was a dark and warm night out.. oh hell I'll skip the specifics.. anyhoo..I was hungry when I got off work.. decided I wanted to eat some fries and since a mofo had me all bent out of shape on the phone I forgot to stop at Wendy's.. SOOOOO I decided to throw some in the oven.. yummmm!! In the meantime..I see on twitter my FAV U-streamer is live from the ATL so i decide let me tune into that.. while i wait. Well, all of the foolywang silliness on there kept me tuned in.. it was funny, and entertaining as hell.. and i couldn't look away..
well i finally remember oh hell im still hungry and i smell the fries.. so i run downstairs to get them out of the oven.. (damn near 30 min later..lol) and open the oven, and b/c im still sniggling hysterically, I somehow manage to DROP the ish and fries flew everywhere.. well my first thought was.. SAVE THE FRIES!!! A MOFO IS HUNGRY!! 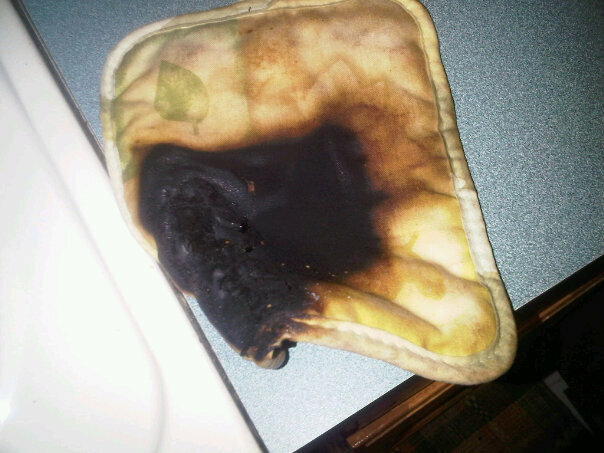 so i fling the pan ontop of the stove.. and pick up the fries off the floor ..(dont act like u dont know the 3 second rule).. and in the meantime.. im guessing the potholder (sniff sniff) slid into the oven during all this flinging ish and junk and i closed the oven door..cuz im still acting like Precious and her last meal on earth and all.. well i decide hell f this.. im dumpin the fries in the trash..lemme make a new batch.. i open the oven door..and FLAMES FLAMES FLAMES are EVERYWHERE..
well thank gawd that ish worked...meanwhile the smoke detector does work and commenced to beepin and workin my nerves..house smokey as hell yet i manage to jump right back online to tell my ustream fam that they made me suffer a LOSS.. I am distraught..house still smells a lil chargrilled.. and I am in MOURNING. the end. Lesson Learned: DO NOT WATCH ish live on U-Stream and try to cook ish.. you will be laughing and singing and won't get ish done LOL. Wow that ia awesome. You def had me rolling. Hope the apt smells better. Girl you never were the cook!! Lol!! !